Situated on the entrance to Bribie Island, Bribie's Moreton Bay Jetski Hire and Ride provides fully guided jetski rides at the southern end of Pumicestone Passage in the Moreton Bay Marine Reserve. 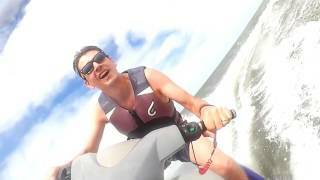 It operates in tandem with its sister company, Caloundra Jetski which has a well established reputation for excellence. Bribie's Moreton Bay Jetski operates a maximum of three jetskis on each tour to ensure personalised service and an opportunity to mix an eco adventure with the thrill of riding a clean, green fun machine. The most popular trip - the 90 minute Brisbane Bucanneer- tracks the epic adventure of explorer Mathew Flinders, who explored Moreton Bay, Pumicestone Passage and the Glasshouse Mountains in 1799. Keep an eye out for the turtles, dolphins and dugongs. A gentler ride is the 60 minute Jolly Roger - perfect for families with younger kids, but we can turn the adrenalin up if required.